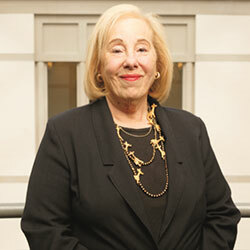 Rosabeth Moss Kanter holds the Ernest L. Arbuckle Professorship at Harvard Business School, where she specializes in strategy, innovation, and leadership for change. Her strategic and practical insights have guided leaders of large and small organizations worldwide for over 25 years, through teaching, writing, and direct consultation to major corporations and governments. The former Editor of Harvard Business Review (1989-1992), Professor Kanter has been repeatedly named to lists of the “50 most powerful women in the world” (Times of London), and the “50 most influential business thinkers in the world” (Accenture and Thinkers 50 research). She has received 23 honorary doctoral degrees, as well as numerous leadership awards and prizes for her books and articles. In 2001, she received the Academy of Management’s Distinguished Career Award for her scholarly contributions to management knowledge, and in 2002 was named “Intelligent Community Visionary of the Year” by the World Teleport Association. In 2010, she received the International Leadership Award from the Association of Leadership Professionals. She is the author or co-author of 18 books. Her latest book, SuperCorp: How Vanguard Companies Create Innovation, Profits, Growth, and Social Good, a manifesto for leadership of sustainable enterprises, was named one of the 10 best business books of 2009 by Amazon.com. Her previous book, Confidence: How Winning Streaks & Losing Streaks Begin & End (a New York Times business and #1 Business Week bestseller), describes the culture and dynamics of high-performance organizations and shows how to lead turnarounds, whether in businesses, hospitals, schools, sports teams, community organizations, or countries. Her classic prizewinning book, Men & Women of the Corporation (which won the C. Wright Mills award winner for the year’s best book on social issues) offered insight about the individual and organizational factors that promote success.Work & Family in the United States, set a policy agenda, and in 2001, a coalition of university centers created the Rosabeth Moss Kanter Award in her honor for the best research on work/family issues. Another award-winning book, When Giants Learn to Dance, showed how to master the new terms of competition at the dawn of the global information age. Her book The Change Masters was named one of the most influential business books of the 20th century (Financial Times). Through Goodmeasure Inc., the consulting group she co-founded, she advises CEOs of large and small companies, has served on numerous business and non-profit boards including City Year, the urban “Peace Corps” now focused on addressing the school dropout crisis, and national or regional commissions, including the Governor’s Council of Economic Advisors. She speaks widely, often sharing the platform with Presidents, Prime Ministers, and CEOs at national and international events, such as the World Economic Forum in Davos, Switzerland. She is Chair and Director of the Advanced Leadership Initiative of Harvard University, a collaboration across the professional schools to help successful leaders at the top of their professions apply their skills to addressing challenging national and global problems in their next stages of life. To read more about Dr. Moss Kanter, visit her personal site.